Who cares about illegal colonies? 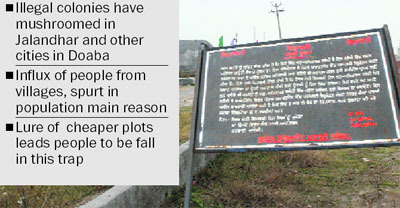 Jalandhar — heart of the Doaba region and considered to be the central point of Punjab — has emerged as a haven for 'illegal' colonisers who have come out with hundreds of colonies in the city and its periphery. The presence of almost 300 unapproved colonies within the municipal limits shows how deep rooted this trend is in this district. Apart from this dozens of illegal colonies greet one on the city outskirts where, builders have carved out such colonies throwing all norms and specifications to the winds due to their powerful lobby and political clout. The economic slowdown has cast a shadow on the sale of residential units in the key markets of Mumbai Metropolitan Region (MMR) and National Capital Region (NCR). This fact has been corroborated by a report released by real estate data analytics and research firm PropEquity. 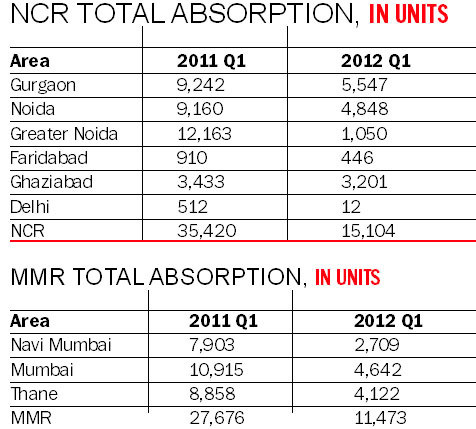 The absorption rate in MMR and NCR plunged by over 50 per cent. How I can calculate capital gain? For many wealthy families the drawing room is no longer the best-decorated place in the house. Designer bedrooms for children are the new fashion statement. BOLD AND BRIGHT: Colourful furniture in shapes in sync with a child’s dream world spreads the bliss of childhood in a little one’s room. Real estate developer Supertech Limited has introduced pre-cast technology to cater to the challenges faced in the traditional style of construction. The company has set up a manufacturing unit in an area of 60,000 sq mt in Sector Ecotech-16, Greater Noida. Whenever one talks about a cactus, the first image that comes to mind is that of thorns that can cause painful pricks. But there is a pleasant surprise for those who shun cacti because of the thorns. 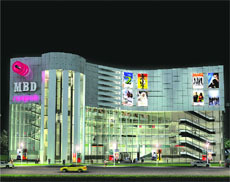 The MBD Group launched MBD Neopolis premium mall in Jalandhar recently. This is spread over 2,50,000 sq ft of area and will entail a premium mall and multiplex with a huge façade of 4,544 sq mt and all the brands in the mall are atrium facing MBD Neopolis Jalandhar is the second venture of the group under the same brand name. 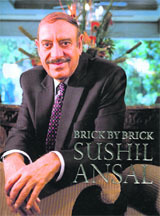 Brick by Brick — the recently launched biography of the Chairman of Ansal Properties & Infrastructure LTD (Ansal API), Sushil Ansal, sketches his life in a series of snapshots. Sushil, the driving force behind realty major Ansal API has had an illustrious career spanning over 50 years, where he successfully transformed Ansal API from a contracting endeavor to its present stature. The biography has successfully captured Sushil’s fascination with ‘brick and mortar’ that started from his early childhood days and it was this fascination that helped him carve a niche in the field of real estate and infrastructure. The realty sector in India is grappling at present not only with an overall slowdown, low sale volumes, increasing cost of land and construction material, there is also a severe fund crunch in the sector as a result of which a majority of the residential projects have been delayed. 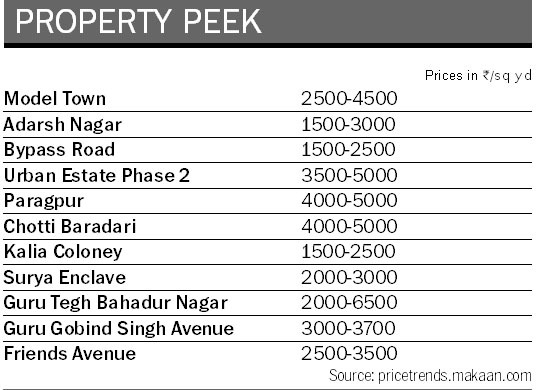 Only 15 to 20 per cent home buyers are lucky enough to get possessions in time in the current scenario. Late delivery means that a home buyer has to bear pre-EMI interest on housing loans. India witnessed the third highest rise of 12 per cent globally in housing prices in January- March quarter of 2012 over the year-ago period, according to consultant Knight Frank. Jalandhar — heart of the Doaba region and considered to be the central point of Punjab — has emerged as a haven for 'illegal' colonisers who have come out with hundreds of colonies in the city and its periphery. The presence of almost 300 unapproved colonies within the municipal limits shows how deep rooted this trend is in this district. Apart from this dozens of illegal colonies greet one on the city outskirts where, builders have carved out such colonies throwing all norms and specifications to the winds due to their powerful lobby and political clout. While the worst part of the illegal growth of colonies is that it drains financial resources meant for the city, these colonisers virtually dupe gullible buyers by making tall promises. The modus-operandi of this lobby, however, is very simple. They purchase a piece of agriculture land at cheap rates and then sell plots to different individuals by making promises of getting the required approvals from authorities soon. In most cases the MC officials often turn a blind eye to such developments. Such "developers" make promises to buyers and talk of extending them a host of facilities like metalled roads, streetlights, sewerage etc at the time of selling land. Some smart operators also show sewage lines and streetlight poles to substantiate their claims. But many a gullible buyer gets a shock to learn later that the sewerage shown to him at the time of sale was not linked with the main sewerage line and streetlights remain unfunctional due to the lack of electricity connection. But, the realisation usually dawns upon them too late as by the time they come to know about the "fraud", the developer has "quit" from the place leaving the buyers with no choice but to look towards the MC to extend civic amenities to them. The Punjab Government has already launched a scheme to regularise illegal colonies on payment of development charges at the rate of 75 per cent. 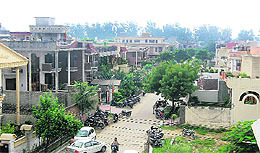 But, according to the Commissioner, Jalandhar Municipal Corporation, Vinay Bublani, residents of most of the identified illegal colonies are reluctant to deposit such high development charges. “We give approval to building plans in illegal colonies if they deposit their individual development charges. But, the development of such colonies is done only if they collectively deposit the fixed development charges,” he added. Officials of the MC revealed that instead of depositing the development charges, many residents prefer to wait for years or try to exert political pressure to get the civic amenities extended to their colonies. "We cannot extend civic amenities like water supply and sewerage to private and un-approved colonies till the residents deposit development charges," said an MC official. This menace is not confined to Jalandhar alone. The phenomena can be witnessed in other major satellite cities and townships like Phagwara, Nakodar, Hoshiarpur, Kartarpur, Lambra, Kapurthala and Nawanshahr in the Doaba region. The main reason for growth of unapproved colonies is the influx of the burgeoning neo-rich and middle-class people to cities and townships from villages due to lack of security and employment avenues in rural areas. Almost everybody living in a village wants to settle in a city these days. Villagers are increasingly getting allured by the glitter of the city life. So, the first stop of most of such people is generally illegal colonies situated on periphery of a city. Tirlok Singh, Senior Town Planner, claimed that strict measures were being taken to prevent the growth of illegal colonies within the city limits. “We resort to demolition whenever, we come across any such new colonies,” he said. Trade insiders, however, say that the MC and other authorities are normally reluctant to take any action when the builders start construction in such colonies. “Violation is rampant. No change of land use permission is taken when a builder takes possession of a piece of agricultural land. The land is used for commercial or residential purposes without depositing the necessary fee or following proper procedure. And all this happens right under the nose of the authorities, but they turn a blind eye to the practice which, has encouraged builders to go in for such unapproved colonies in a big way,” said a local property dealer. 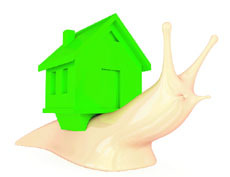 The total absorption in NCR has dropped to 15,104 units in the first quarter of 2012 from previous year’s 35,420 units. Total residential supply in this period was 107,731 units. In MMR, the total absorption fell to 11,473 units from 27,676 units. 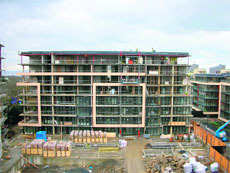 The total supply in the first quarter of 2012 was 89,461 units. A major reason for this decline in sales is the prominence of investors in these two markets. Both NCR and Mumbai are among the most sought after destinations for investors wanting to park their funds for quick profits. The negative sentiment in the market over the past few months, however, is keeping the investors away and as a result there is massive inventory pile up for developers. Commenting on this downward trend Samir Jasuja, founder and Chief Executive Officer of PropEquity, said, “The take-up rates in key micro-markets have fallen significantly. In the coming quarter there would be strong pressures on many micro-markets and we expect inventory overhang to increase and absorption could continue to slow down. Mumbai and Gurgaon have already seen one of the sharpest falls in absorptions; with MMR seeing a drop of 58 per cent and NCR of 57 per cent. If this trend continues, there could be ‘stage 1’ price correction in the range of 5 to 20 per cent, especially in micro-markets of NCR, MMR and Hyderabad”. However, according to market watchers some micro-markets where inventories have been managed well by developers would be able to overcome this phase. As Bangalore has fared reasonably better as the demand has been end-user driven and new inventories have been fairly low in first quarter of 2012. In Bangalore, the total absorption fell just 18 per cent to 7,704 units in the first quarter from previous year’s 9,410 units. While filing Return of income for the financial year 2007-08 (assessment year 2008-2009) my friend claimed as expense 1/5 of pre-construction interest of Rs 4535 + 59,183 and entire interest of Rs 96,221 for the year of 2007-08, including interest of Rs 55,272 for the period 1.4.07 to 31.10.07 against rental income for the financial year 2007-08. The assessment, thus, stands completed. A. The facts given in the query do not indicate whether the pre-construction period interest has been claimed and allowed in the succeeding financial years also. I presume that the proportionate interest for the succeeding assessment years i.e. assessment years 2009-10, 2010-11 and 2011-12 must have been claimed by your friend in computing his total income and the same must have been allowed as a deduction. In case the deduction of such interest has been allowed, it may not be possible to treat the same as part of the cost of the residential house. In such a case it would be a case of claiming double deduction of the same amount which is not permissible. A. I have gone though the reply published in response to the query of R.K. Arora on 29.11.2008. I have nowhere referred to the decision in 86 ITR 783 in the reply. The trial judge is correct in observing that the name in the conveyance deed does indicate the ostensible owner of the property. The issue raised in the query was regarding the property purchased in the name of three brothers who had jointly pooled their resources for the purchase of such property. The person who had sent the query wanted to know as to how the sale proceeds of the property so purchased would be divided between the three brothers. The reply was therefore, based on the facts of the case given in the query. He had not raised any issue as to the rivalry between the three brothers. It seems facts of your case are not same, and therefore, the said reply would not be of help to you. A. You should get the report of an approved valuer regarding the cost of construction of the house. Such report would be an evidence for the amount spent on the construction of the house. The cost so arrived at will be the basis for computing the indexed cost. The indexed cost on the said basis would enable you to compute the amount of long-term capital gain. A. You have not made it clear in your question whether the custody of your daughter was with you or with your husband after your divorce, and also whether she was a major or a minor at that time. You have not mentioned whether your ex-husband had married again or adopted/had any other child and whether any Will was left by him. From the details that you have mentioned in your query it is clear that any amicable settlement in this case is not feasible and you have done the right thing by taking legal action. The points that I have mentioned above can have some bearing on your case, and in the absence of any amicable resolution you will have to wait for the law to take its course. A. As the property in question is ancestral and not your self-acquired property, all the natural legal heirs are co-owners/co-sharers in it. You can make a Will only for your share and not for that of anyone else's share. For this the best solution will be to make for a family settlement deed. 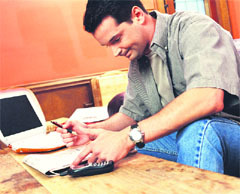 The family settlement deed can be self-drafted or you can take the help of some legal expert. The property can be divided the way you wish by the way of this settlement and all the co-sharer will put signatures unanimously. The deed has to be duly attested by witnesses. You can also take affidavit from your daughters in which they can relinquish their rights to the property. After completing the settlement deed along with the affidavits you can forward it to the authority concerned for registration to carry out mutation in the revenue records. This will clarify the title of this property for future generations. For many wealthy families the drawing room is no longer the best-decorated place in the house. Designer bedrooms for children are the new fashion statement. Many parents like Anita Khullar, mother of 3-year-old Avisha, believe, "Children must have their very own special room. It gives them privacy and a sense of belonging." Yes. Time spent alone in their little kingdom implies that it should have a study area as well as a play area. Children's rooms are coming in for a sea change. Elaborately designed, they have space for computers, musical instruments, electronic gizmos and of course toys. Take a look at five year old Aman's room. A double bed set in an L shaped room with a storage and display unit for his toy cars and planes. On each side of the bed there is a cupboard with Mickey and Minnie Mouse painted on it by an artist. Designers are going in for vibrant colours that hold immense fascination for children. Delhi based interior designer, Vandana Gogia, says, "Whenever I am called in to design such a bedroom, I generally prefer to sit with the kids and discuss what they want. They can be quite clear headed about their preferences". Malik has designed her own two daughters' bedroom, "as they wanted it to be". The main attraction being the bunk beds and elephant shaped chairs. "I love animals. When I sit on the chair its like I am taking a ride on an elephant", says eight year old Shreya. But setting up an elaborate kiddie room can cost a bomb. Interior designers charge anything from Rs 50,000 to Rs 3 lakh depending on how far the parents are willing to go. As Vandana says, "Most moneyed parents really don't mind fulfilling the desires of their children". Pencil shaped cupboards, beds designed like school bags, Jacuzzis instead of tubs, florescent walls, giant TV sets enclosed with a rubberized cartoon casing. Imaginations can run wild. And so can the bills. Doing up the junior's room is a new indulgence for parents. It is as much a status symbol as owning an Omega watch or a vacation on a European cruise. That's where the designers step in. Call it a fad of the rich but the fact is that kids are being pampered with a room of their dreams. After all your child's well designed room would surely make you look more caring, successful and considerate. With the rise in nuclear families and parents spending more time out of their house, a bedroom is a very private haven for children. Bunk beds and geometry box shaped table tops define their territory. But not just the rich, the trend is catching on even in upper middle class homes as well. Even though it may not necessarily be a room straight out of a picture book, it certainly fulfils a child's need for privacy. Abha Arora, a Delhi based housewife, agrees that it is important to have a separate children's room furnished by a designer. Most designers say that children's rooms should be colourful and reflect joie de vivre. Natural light should be in abundance. Open spaces lend a sense of unrestraint appeal. Rudyard Kilpling would have never dreamt that Mowgli or Sher Khan would ever be printed on bedsheets. Kiddy prints ranging from Winnie the Pooh to Superman, Cinderella and Tin Tin have found a new and a ready clientele. These can be purchased from any store dedicated exclusively to children. Furniture too has to be sturdy, safe, colourful and imaginatively designed. Mickey Mouse chairs or those designed like yachts and boats are put in the centre of the room as sitting arrangements to let the kids' imagination sail and rainbows on the walls to fill a little colour in their lives. Real estate developer Supertech Limited has introduced pre-cast technology to cater to the challenges faced in the traditional style of construction. The company has set up a manufacturing unit in an area of 60,000 sq mt in Sector Ecotech-16, Greater Noida. This unit will have a production capacity of 5.0 million sq. ft. area per annum where roofs, walls and floors of a pre-cast house will be constructed. The company has also set up two separate units in this factory - one for Hollow Slab and the other for Pre-cast Wall Panels. All machines and units required to execute the process of construction have been imported from Germany. In pre-cast construction, the structures are not made of mortar and cement but of beams, columns, panels, slabs and standard concrete. Such construction does not need plastering as the surface made is very smooth and requires very less maintenance. The technology strengthens the overall solidness of the house much more than a traditional house. With the use of this technology, a hindrance-free construction can be carried out in any season saving up to 64 per cent of time as compared to the construction time of a brick house. "With speedy production process a large number of units will be delivered in short span of time at an affordable cost - this technology cuts down the construction cost by 10-15%", says Mr. RK Arora, Chairman & Managing Director, Supertech Limited. The technology can be used in construction of high-rise buildings which will prove beneficial to both the developers as well as the customers. Pre-cast Concrete Technology has already proved its worth in Europe, Dubai, Malaysia, Singapore and many other countries worldwide. The best part of the technology is that it not only speeds up the construction work but also enhances the quality of the final output. Also, it helps in creating bigger carpet area. In a precast house, a defined space is left for windows, doors and all fittings such as Electrical, Plumbing, TV, Telephone, etc., which shall be laid before concreting. Everything will be controlled and monitored through computer which ultimately helps in making the structure stronger and better shaped. Whenever one talks about a cactus, the first image that comes to mind is that of thorns that can cause painful pricks. But there is a pleasant surprise for those who shun cacti because of the thorns. Many of cactus species are actually without thorns and these "spine-less" beauties are much sought after by gardening enthusiasts and are a collector's delight. So if your Vaastu expert has cautioned you against keeping a cactus inside your home because it has "disturbing" thorns, you can opt for these thorn=less marvels. Not only this, a beautiful and unique collection can be made from these as they can be accommodated in a small area. Lophophora williamsii, Turbinicarpus pseudopectinatus, Frailea castanea, Pelecyphora aselliformis, Aztekium ritteri, Tephrocactus diadematus, Astrophytum asterias, Astrophytum myriostigma, Echinopsis subdenudata, Echinocereus viereckii var. morricallii, all eight species of Ariocarpus, epiphytic cacti, and some more. Aztekium ritteri is one of the most stunning and one of the slowest growing diminutive globular cacti. It seldom exceeds 5 cm across. Despite its small size, when this plant matures, it readily offsets and forms a cluster of heads. This may take 25-30 years to form a 10-12cm group. Due to its unique shape it can't be mistaken for any other species. l Water this plant sparingly during summer, but during winters it should be watered regularly. l Grow it in filtered light conditions. l Compost used should be gritty and freely draining. The distinctive features are its secondary ribs which form numerous furrows on the main ribs to make it an architectural wonder. The blooms are pink to white and flower profusely throughout the summer. As it is a rare and a difficult to grow cactus, it is generally grafted on pereskiopsis stock to encourage growth and also to reduce its difficulty in growing. Epiphytic cacti also known as jungle cacti are often found growing on trees in tropical rainforests and have evolved in forests where the climate remains warm and humid throughout the year. They are called epiphytic because they grow on other plants without being parasitic on them. Unlike other cacti, these are thorn-less plants with flat and thick stems resembling leaves. Popular Christmas cactus also falls in this category. l Use normal freely draining cactus compost for good growth. l Fertilise with NPK (nitrogen, phosphorous and potash) every month during summer season. l As it comes from a humid area, don’t allow the plant to dry out completely. If you have not seen a Christmas cactus plant, then you surely have missed something. These are good looking plants with magnificent display of 5-8 cm long tubular shaped, white to pink coloured blooms during winter months. These add colour to the garden when most of the other cacti are still dormant. Christmas cactus is the common name of a species of epiphytic genus Schlumbergera. With some of these plants having pendulous type of growth, a long lasting and a beautiful hanging basket can be created using these. It is easily propagated through stem segments. This is one cactus whose top foliage can be pruned from the nodes with a sharp knife to encourage the plant to become bushy, in order to have more clumps of blooms in the ensuing season. This is done after the flowering period is over and when the cactus is in rest. Lophophora williamsii is a bluish green Mexican spine-less cactus with a soft body and well-defined ribs and furrows. Its beauty is enhanced by the growth of tufts of wool which are equally spaced on the ribs. The climax comes when it is seen with pink flowers on its apex. It has a large tap root and needs to be grown in a deeper pot for its good growth. It is a slow-growing species and takes three to five years to flower. However, it can be grafted for rapid growth. Normally the plant remains solitary, but sometimes forms clumps. The MBD Group launched MBD Neopolis premium mall in Jalandhar recently. This is spread over 2,50,000 sq ft of area and will entail a premium mall and multiplex with a huge façade of 4,544 sq mt and all the brands in the mall are atrium facing MBD Neopolis Jalandhar is the second venture of the group under the same brand name. MBD Neopolis Ludhiana which entails a mall, multiplex and a 5-star deluxe hotel was launched two years back. Speaking on the occasion Ms Monica Malhotra Kandhari, Senior Director, MBD Group said, "We have already created a successful brand of MBD Neopolis in Ludhiana and we are all set to repeat the same success in Jalandhar also. It has been our endeavor to give Jalandhar the best of brands under one roof along with a memorable shopping experience and I am sure with MBD Neopolis we will offer nothing but the best to the city and its people." It will have premium retail brands, anchor store by Shopper's Stop, Multiplex by PVR, World Food Lounge and Bar Gigabite. Some of the vanilla brands at the mall include Gant, French Connection, , jack& Jones, Calvin Klien, Woodland, Tommy Hilfiger, Tommy Hilfiger Travelgear, Blackberry, Nike, Levis, Kazo, Add on among others..
Real estate developer Green Tree Homes announced the inauguration of "Green Athens", the first project of the company's Rs 500 crore investment plan, in Chennai. "Earlier this year, we had announced our investment plans of Rs 500 crore in the next three years. This is the first leg of that plan. We hope to complete bookings (for this project) within the next few months..." Green Tree Homes and Ventures Director Dinesh Ethiraj said in a statement. The Green Athens project, spread across 3.16 acre is located between the East Coast Road and IT corridor. Each house covers an area of 4,000 to 5,000 square ft with an exclusive terrace and swimming pool, the statement added. The houses are equipped with teak wood doors and windows, imported marble living rooms, wooden flooring in bedrooms, ceramic tiles and toilet fittings, it said. 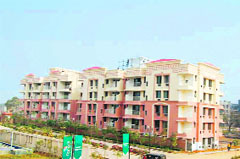 Upcoming realty developer UP Infraestate Pvt Ltd will invest Rs 5,000 cr in building townships in Uttar Pradesh. The group has plans to develop a 500-acre township near Greater Noida. This marks its first entry in the real estate and it plans to develop luxury and affordable housing and commercial space. The company is headed by Raghunathan and is supported by M/s Rudrabhishek Enterprises Pvt. Ltd (REPL), which specialises in managing projects and serving as a knowledge centre for developing customised design for new-age township development, urban planning, architecture, engineering services with integrated marketing solutions. Godrej Properties Ltd. (GPL), the real estate development arm of the Godrej Group, recently announced the launch of Godrej Serenity, a premium residential project at Chembur, Mumbai. Godrej Serenity will be a 17-storey tower comprising spacious 3 and 4 BHK luxury apartments and two exclusive duplex penthouses. The project will have modern lifestyle amenities like a club house, gym, jogging track, a dedicated kid’s play areat. The book, authored by well-known journalist and writer Ashok Malik, traverses the labyrinths of highs and lows that shaped his life, and tells his life’s story in a mix of free form of pictures from his childhood, early days of his career, work and his current projects. It also gives a peep into his philanthropic side and passion for promoting and expanding the field of education. The realty sector in India is grappling at present not only with an overall slowdown, low sale volumes, increasing cost of land and construction material, there is also a severe fund crunch in the sector as a result of which a majority of the residential projects have been delayed. Only 15 to 20 per cent home buyers are lucky enough to get possessions in time in the current scenario. Late delivery means that a home buyer has to bear pre-EMI interest on housing loans. Delay in the completion of projects is one of the major concerns in the real estate sector at present. Why are builders not able to stick to their deadlines? Yes a large number of projects all over the country running are behind schedule. Delays dent the credibility and image of a builder and the customers have to unnecessarily suffer financial hardships as well as mental stress. Managing cash flow and labour turnover are the two major issues that need to be addressed in time if a project has to be completed in time. Mostly, developers overlook these two issues and are not able to meet the scheduled deadlines. A standard practice of diverting funds from the existing projects to score another project is a major reason for delayed projects. Secondly, very high labour turnover rate slows down the output and a project gets delayed. What are the key practices that your group has adopted, which ensure not only timely delivery? At Ashiana Housing, we have adopted a unique practice, where we are not banking on land; instead, we are treating it as a movable stock. Hence, we are always in position to allocate adequate funds for each stage for seamless construction. We don't invest our cash flow in future projects. We always make sure that enough cash flow is available to construct on top. Secondly, to control labour turnover rate, we have a process in place where labour is given adequate facilities and incentives i.e. medical facilities, proper dwelling arrangements etc. Another factor is transparency, which is the main reason that our group has always managed to deliver projects before time. Which are the projects where your group has given possessions before the stipulated time? Last year we have given ahead of schedule deliveries for projects like Amarbagh in Jodhpur, Angan in Bhiwadi, and recently we have given possession of Rangoli Garden in Jaipur. Possessions for this project were to be given in September 2012 and we have managed to complete it four months in advance. Overall, we have delivered almost 800 units ahead of the scheduled date so far. What is the total size of the projects and how many units will be there? Rangoli Garden has 1600 units comprising 2 BHK with approximate constructed area of 2.80 lakh sq ft.
On an average what should be the monetary benefit to a buyer who gets pre-scheduled delivery. On time or before time delivery of any real estate project, not only helps a builder to create a strong connect with his customers, but also means significant saving for the buyer. For example if 200 flats are delivered four months ahead of schedule, there will rental saving of approximately Rs 80 lakh (average monthly rental Rs 10,000x200 =20,00,000x4 months). Housing prices in India, however, declined by 0.9 per cent when compared with the previous quarter. “Brazil recorded the strongest annual growth (23.5 per cent) and Ireland the weakest (minus 16.3 per cent),” it said. The Knight Frank Global House Price Index monitors and compare the performance of 53 mainstream residential markets across the world. Austria ranked fourth with 11 per cent rise in housing prices, followed by Germany (9.8 per cent), Colombia (9.6 per cent), Turkey (8.7 per cent), Russia (8.2 per cent), Iceland (7.3 per cent) and Canada (6.8 per cent). In China, the prices have declined by 2.2 per cent. "The Chinese housing market has had a tough 12 months as developers and purchasers alike have had bank finance squeezed as a consequence of the ongoing cooling measures. "Lending restrictions, new taxes, the curbing of multiple property purchases, and new regulations to restrict the inward flow of hot foreign money have had the desired effect," Knight Frank's Director of Research in Asia Pacific Nicholas Holt said. The report further said during the first quarter of 2012, the housing prices fell in 58 per cent of the countries monitored by the index. Knight Frank's report noted that the Global House Price Index recorded its weakest annual performance since the depths of the recession in 2009, recording only 0.9 per cent growth in the year to March 2012. "Doubts over the Eurozone's future, along with the Asian governments' staunch efforts to cool their markets and deter speculative investment, have taken their toll," it explained.